We're probably a lot closer to a Bed & Breakfast run out of a trailer in 2008 then we were in 1998. 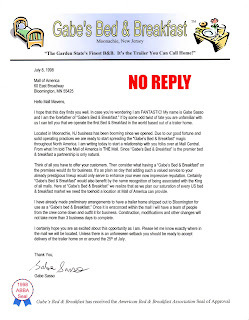 I remember when I wrote this letter and forwarded it to my friend Brian Vermeire I wondered what sort of design he'd come up with for the letterhead. As usual he exceeded my expectations. I can't imagine why the Mall of America people didn't reply.